1 1/2 inch. 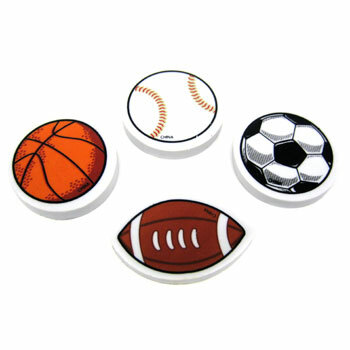 Assorted design sports ball erasers. 48 pieces per tub. Sold by the tub. $6.75 per tub (48 pieces). $4.40 per tub for 25 tubs or more. $3.80 per tub for 50 tubs or more.